The government has also cleaned up most of the obvious drugs and debauchery, although no doubt they would still be available if you looked hard enough. It is still very much a party town however, just based on alcohol. 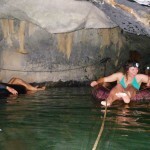 We booked a tour which took us to a couple of large limestone caves. This second one is very long, according to the guide it would take a month to get to the end and back. Yeah right. We walked in for about a kilometre or so. We then walked through a rural area for a while till we came to another cave with a river running out of it, and a rope tied to the roof disappearing into the darkness. The guide gave us a large inflated truck tube and told us to explore while he cooked us kebabs for lunch. At the end of the rope, I saw that another group had left their tubes and gone up a dry side passage, so we followed them for a while until we got back to the river. I decided to wade up river for a little way, and discovered the start of a second rope. By the time I got back to where we left the tubes and convinced our group to continue, a couple of other western girls and their guide were also heading in further. We must have pulled ourselves in for another km or so before the rope ended. I would have turned back at that point, but the guide suggested we paddle our tubes in even further, so we continued for several hundred metres more before discovering the end. On the way we disturbed a colony of bats which kept appearing in the beams of our headlamps as they flew past. When we finally emerged into the daylight, our guide was starting to get quite concerned, because he obviously hadn’t expected us to continue beyond the first rope. He also had told us we wouldn’t need footwear, which would have come in handy when we explored the dry middle section. No tip for him! After eating our now cold kebabs, we walked some more, stopping briefly at a cave with a large Buddha and a stalactite in the shape of an elephant. Someone had spent some time making garishly painted concrete figures of a snake, a mermaid, and an owl eating a frog, which didn’t do much to enhance the sanctity of the place in my opinion. A short drive later bought us to the river tubing drop-off point. 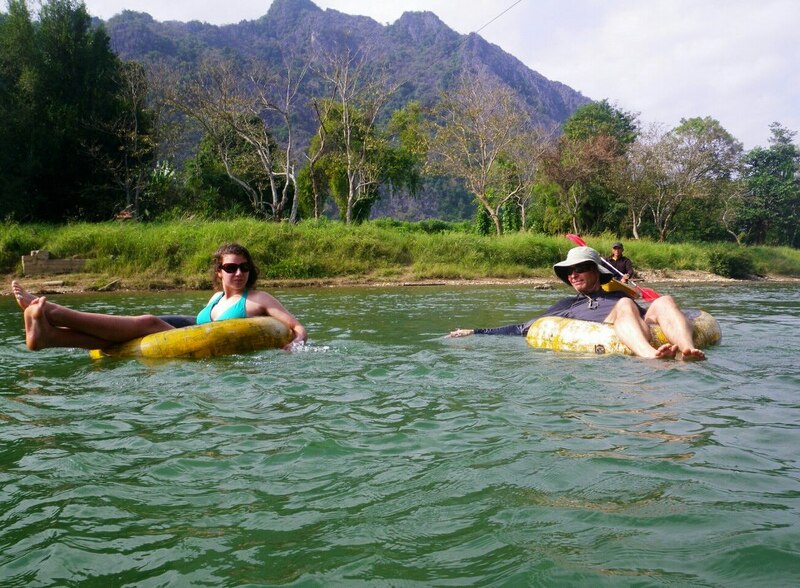 Floating down the Nam Song river in a tube is pretty much compulsory for tourists in Vang Vieng, although it has also changed radically in the last year. The banks of the river used to be lined with bars, and there were huge swings with bungy cords, giant zoom slides, and platforms to jump off. Needless to say, the combination of water, young tourists, and dangerous equipment combined with huge amounts of alcohol resulted in numerous deaths and serious injuries, so the authorities have closed most of ths down as well. When we arrived on the river bank, we found dozens of other tourists about to depart, most clutching a large bottle of Beer Lao. Along the way, we noticed a couple of obviously illegal bars operating surreptitiously out of chilly-bins hidden in the bushes. It was quite entertaining for the first half hour or so, but unfortunately the sun was hidden behind clouds and we started to get cold. By the time we reached town after two and a half hours or so, we were freezing and glad it was over. A warm shower at our hotel followed by a hot coffee cheered us up, and a walk around the town made us warm again. We’ve just finished a Thai dinner on a terrace restaurant overlooking the river, one of the few places playing tasteful music at a volume low enough to have a conversation. 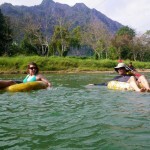 Vang Vieng isn’t really our scene so we’re on our way again tomorrow morning bound for Vientiane.